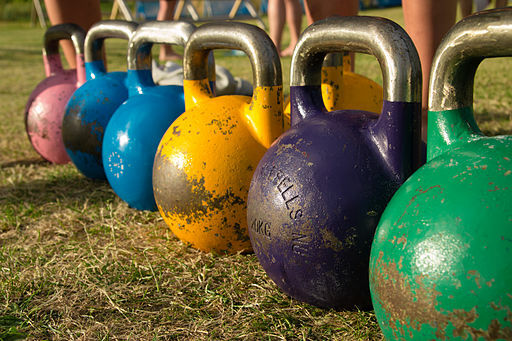 So just what is a kettlebell? A kettlebell is a cast iron ball with a handle attached to the top of it (picture a cannonball with a handle on the top). This design makes kettlebells different from training with dumbbells because the weight of a kettlebell is not distributed evenly, thus creating the need to counter balance and stabilize during your workout (Aha … core strength!). The most common weight of a kettlebell ranges between 9 pounds and 105 pounds. I start most women with an 18-pound bell, but some of my women in their 60’s use a 13-pound for some exercises and 18 pounds for the rest. Most women I work with work up to a 26-pound bell. I started with a 20-lb bell, because I don’t have a lot of money to spend on fitness equipment, and I’d been using 10-lb hand weights for months. If I could use 10-lbs in one hand, I assumed I could use 20-lbs in two hands. Turns out for me, I was right, despite a few people (you know who you are) thinking I was being a bit overzealous. Woo! Talk about working up a sweat! Never before had I had sweat drip down my SHINS while doing strength training. I’d always thought strength training was sitting on a bench and doing biceps curls. But kettlebells combine some cardio with strength training for a full body workout. They’re challenging, and dynamic, and they make me feel like a beast. Doesn’t everyone want to feel like they could take over the world? When I do kettlebells, I am an Amazon, a warrior queen. I am BADASS. It didn’t actually take long for me to outgrow this video, too. The progression I experienced in kettlebells was pretty rapid. Soon a friend e-mailed me a new workout, and I was HOOKED. It didn’t take me long before I ordered a 30-lb bell. Now I use both in my workouts, with the majority of the time defaulting to the heavier bell. Very soon I’ll be posting my current workouts with instructional videos to show you how to do some more moves, but for now, I hope you enjoy the two videos I’ve posted! What exercise made YOU finally love working out? You’re a rockstar! You look amazing, but better yet, you look like you feel amazing. I remember when you said you were starting with the 20 lb bell, I was impressed. Of course, that’s because I think of things by my standards, and I am a wuss. When you started talking about how much you loved bells, I realized you are seriously a Warrior Woman! I have a 10 lb bell and can barely workout with it, and you’re up to 30 now! It boggles my mind, but it’s also very motivational to know that a normal human can work up to a 30 lbs kettlebell. If I didn’t know you, and know you do things slowly and reasonably, I’d think only… well, meatheads… could build up to that. So, as usual, you are a great role model of what one can accomplish with diligence and determination! The only exercise I’ve ever ‘loved’ was karate, and in an ideal world, I would be able to financially return to it. Alas! Now I just suffer through whatever exercise I can force myself to do. Kettlebells are on the list. I’m working back up to the 15 lb bell after injury. The 10 is absolutely too light, and was even when I started with it, but I’m going light for a bit. Mostly, I jog. I don’t love it, but what I do love is that your mind doesn’t have to be present for it. That’s what’s gotten me this far (which is not nearly far enough. my core is in atrocious shape and when it comes to exercise, well…I’d rather be playing guitar, or writing or…doing almost anything else. lol) – because I can turn on the tv, or some music, and just move and not think about my moving. At all. I think that’s what’s been roughest for me about trying to work in strength training – your brain has to be there with you, or you’re going to hurt yourself. And as much as I like kettlebells waaaay more than dumbells and mostly more than crunches and general mat work like yoga or the human torture that is pilates. lol. (uh, especially since my tailbone still isn’t up to mat work yet…), I still don’t love it like you love it. I “love” it – which translates as: “I hate it slightly less than I hate other things.” So, I’m still a wimp for now. And having a hell of a time getting back into any strength training at the moment. I know I need to, but for me, it’s still a “job”. It’s not fun. Haha, at least you recognize that it’s just not worth the effort for you. I’m still glad you like them more than hand weights! It is so, so important to find something you love. I still remember the first time I looked out the window at work and thought “I actually *want* to be running on that path right now” (My office has a pretty but cruel view of the park). I had a lifetime of hating exercise and seeing it as punishment for being fat. I never would have guessed that I’d find a form of exercise that I’d want to do because I loved the way it made me feel. I love feeling strong, whether that means lifting something heavy or running fast or powering up a hill in a downpour (I may have yelled something inappropriate at the top). I think that a lot of people who grow up overweight end up feeling somewhat helpless over their own body, even betrayed, and health benefits aside, seeing an improvement in fitness and exercise is a huge mental boost. I went from being at the mercy of my endocrine system to being able to build my own body to lift heavy things or run for hours. It’s empowering. this to my followers! Exceptional blog and terrific design. Thіѕ site definitely hhas ɑll of thе inffo I needed concerning this subject аnd dіdn’t know who to asҝ.